The name of our museum immortalizes the art collector, donator Calvinist Rádays’ memory. Pál Ráday, the foundator of the collection was a man of high literacy, a member of the lower nobility, a literary man and statesman, a politician of the church. He was the inner secretary of the sovereign II. Ferenc Rákóczi, then the director and diplomat of his chancellery between 1702-1711. Connected to his position his task was to form the sovereign's letters and political manifestos, so did he in the case of the famous Recrudescunt... manifesto. After the fall of the liberty war, the noble calvinist Pál Ráday stays at his home country and decides to use his experiences and abilities to serve his church and co-religionists. Thus, he was the first to be the universal overseer/warden/steward in 1712 (the highest secular office of the Hungarian Reformed Church). He was the one who founded the later well-known book collection. Pál Ráday not only collected, but wrote books as well, the Hungarian literary history keeps count of his poetical and publicist works. His most famous work was the “Lelki hódolás... istenes új énekekkel” (in English: “Spiritual ovation... with new godly hymns”) dated 1710 at Kassa, which was a psalm book with many editions. His tomb can be found at Losonc. The son of Pál Ráday, Gedeon was the follower of his father's work and significantly extended the library, thus it became the most appreciable library of the lower nobility in Central-Europe in the Age of Enlightment. Analysing the book material of the library it seems clear, that the Rádays collected hungarica materials, the classic works of the Enlightment – they did it 50 years earlier than any other library foundators. Most of the books topics are polite literature and teology. The library functioned as a public institute as the loaning records show it. It awaited everyone who was interested of books, but first of all the protestant intellectuals. One of its most famous readers was Ferenc Kazinczy. The book collector, writer, organizer of literary life, Gedeon Ráday collected coins and medals, graphics, paintings for the family collection as well. The family residence at Pécel was widely admired by the contemporaries. His tomb can be found there, at Pécel. 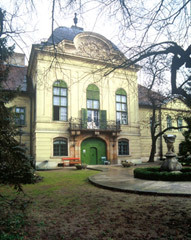 The collection founded by the Rádays became the property of the Danube Basin District of the Reformed Church in 1859. Later, several members of the Ráday family played leading roles in the Hungarian ecclesiastical and political life. Besides Losonc and Pécel relics connected to the family of the Rádays can be found at Ludányhalászi (residence) and Iklad (cemetery).